Woodshed Archive’s Wednesday night special double session concludes with “Don & Sara Ann”, a husband-wife duo who co-own, work for, and teach at Freeway Music Lesson Studio while performing around the Columbia area, primarily at private events, weddings, and restaurants. Tune in from 9-10pm for their acoustic set. Don Russo began playing in bands in high school and continued through a slew of various rock groups. He tried his hand at Jazz and fronted a local trio called The Don Russo Trio which performed at Speakeasy every Thursday for 6 years, and still performs for private functions. Don also played in a Bluegrass trio called The Real McKoys in which he played Mandolin, Guitar, and Bass. He quickly earned a very strong reputation in Columbia as a guitarist, singer, and instructor. After playing the role of sideman for a while, Don forged an original effort, called Charming Hala. He released an album of original material in December of 2010 and another EP in October of 2011. This band was voted one of the best local bands of 2010 by The Gamecock and was featured on the New Brookland Tavern Compilation CD. Don has shared the stage with many great acts including: Widespread Panic, Marcy Playground, Tonic, Eve 6, Will Hoge, Ashford and Simpson, Drivin’ and Cryin’ and more. These many years of playing experience and public performance help him bring a special insight to his instruction. Sara Ann Russo is Freeway Music Northeast’s Assistant Director, and has had a passion for music since she was a toddler, humming nonsense in grocery aisles. She began vocal training at age 14 with Dr. Rhoda Paschal and has continued studying with various instructors throughout her adult years. She is currently studying under Jazz singer and pianist, Jenna McSwain based in New Orleans. She is also finishing up her Specialist Certificate in Vocal Technique and Musicianship from Berklee College of Music. 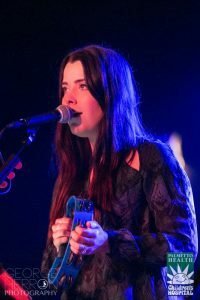 Berklee has been a dream of Sara Ann’s to study under, as many of her musical influences are alumnae, including John Mayer, Esperanza Spalding, and Diana Krall. Don and Sara Ann Live from the Woodshed [dosa2016-05-25] by Don and Sara Ann is licensed under a Creative Commons Attribution-NonCommercial-ShareAlike 4.0 International License. Based on a work at https://woodshedarchive.org/event/dosa2016-05-25/.